In the fall of 1872, nineteen travelers were marooned in the Arctic Ocean. Lost during the infamous Polaris expedition, this miserable band included sailors, explorers, and a newborn baby. They lived on a five-mile sheet of ice for months, building huts out of ice and snow, and hunting seals for food. During the ordeal, a German immigrant taught the survivors how to play a game with homemade cards called euchre. When they were rescued months later, the makeshift card game was memorialized in a survivor’s diary, a rescuer’s memoir and a Congressional report about the disaster. At the time, euchre was one of the most popular games in the United States. In 1862, Library of Congress law librarian Charles Wharton Meehan described the game in his book, The Law and Practice of the Games of Euchre: “No sedentary game is more popular, or so generally played for amusement in domestic circles, throughout the wide spread ‘eminent demesne’ of the United States, as euchre — the Queen of all card-games.” These days, most Americans don’t even recognize the word “euchre,” but it has been kept alive by loyal bands of Midwestern card players who live in Illinois, Indiana, Kentucky, Michigan, Ohio, and Pennsylvania, a geographical body dubbed the “Euchre Belt.” Growing up in Michigan, I was a scrawny flute-playing pre-teen with pink plastic glasses; I learned how to make friends while playing euchre. By the time I joined the junior high band, I had mastered the game, so I played cards with the rest of the outcasts. You can play euchre on any surface, but I learned that trumpet cases work best. If poker, where every bet is an attempt to bankrupt the other players, promotes cut-throat enterprise, then euchre, where every calculation is made with your partner’s support in mind, embodies small-town communalism. 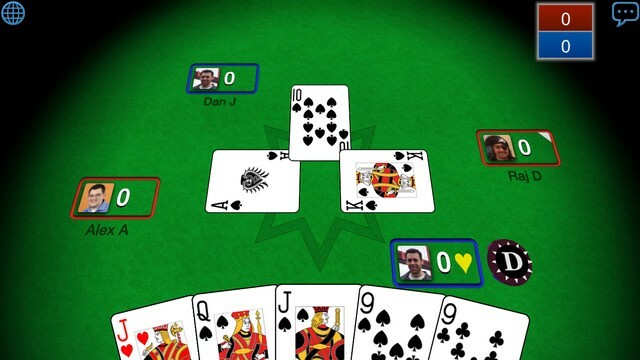 Four players split into two teams, with the average game taking less than a half hour to play and requiring just twenty-four cards — a skinny deck of nines, tens, jacks, queens, kings and aces. Before any cards are played, players must decide which suit should be trump, the most powerful in the game. Each time a card is played, players try to top it and win the “trick.” The first team to collect three tricks wins the round and scores; the first team to score ten points wins. 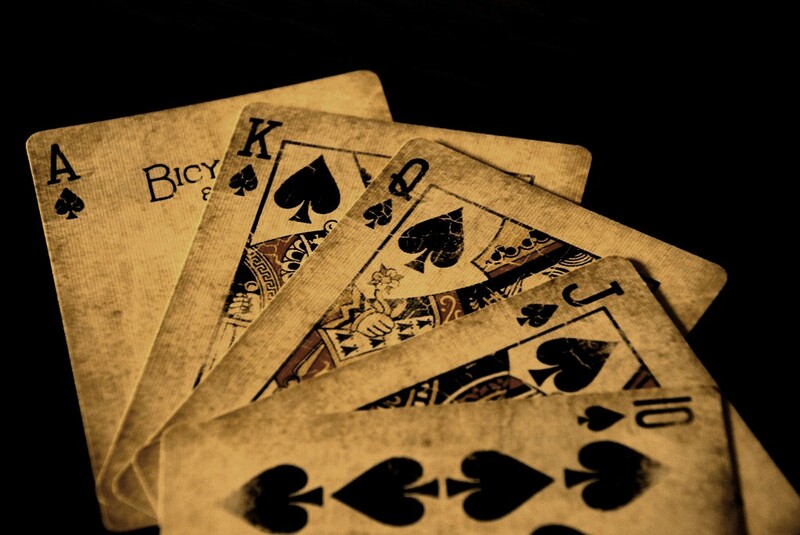 Euchre began as a variation of an older card game carried over by German immigrants as they traveled across the United States in the nineteenth century. Historians haven’t pinpointed the exact moment of euchre’s American arrival, but the earliest reference to the game in the United States is in actor Joe Cowell’s memoir, Thirty Years Passed Among the Players in England and America, where he writes of learning the “mysteries of uker” on a Mississippi river cruise in 1829. Playing card scholar David Parlett, the author of The Oxford History of Card Games and The Penguin Book of Card Games, has traced euchre’s origins back to a game called Juckerspiel, which was played by immigrants from the Alsace region, a sliver of territory along France’s eastern border with Germany. The two countries passed control of the region back and forth for centuries, but the region included a sizable German-speaking contingent and produced a wave of German immigrants to the U.S. in the nineteenth century. The two games share striking similarities, and Parlett believes the word “euchre” is an Americanization of the “jucker” in juckerspiel. They also share a crucial twist: The jacks — called “bowers” in euchre — are the most powerful cards in the game. Euchre never again managed to find mass media success the same way as bridge or poker, which lent themselves to newspaper columns and breathless play-by-play descriptions from TV announcers. After bridge displaced euchre as America’s high-class card game, it returned to its humbler roots; people played euchre in factory break rooms, school cafeterias or grandma’s card table because it wasn’t complicated and didn’t require your complete attention. Euchre eventually did find its own self-published champion during those lean years. In 1982, small-town lawyer calling himself Natty Bumppo (a name plucked from James Fenimore Cooper’s famous nineteenth-century frontier novels) independently released The Columbus Book of Euchre, which he billed as “the first book published strictly on euchre since 1905.” It contains staged photographs of wild euchre games, with imaginary players threatening each other over Bowie knives and handguns and beer bottles. Bumppo estimates that he has sold between four or five thousand copies of his book over the years. Despite Bumppo’s efforts, a United States Playing Card Company survey in 1992 reported that only nine percent of the card-buying public still played euchre. More recently, the small but loyal digital euchre audience has moved to smartphones and tablets. I recently counted more than twenty-five euchre apps in the Apple App Store, but one game has ruled them all since the demise of Yahoo’s euchre site: Euchre 3D, which, as of publication, is currently ranked 1,238th in the free game category. Its app page glows with the giddy obsession of the game’s core fan base; it has more than four hundred reviews, and the average rating is four-and-a-half stars. However, the art of conversation has been wholly stripped from the App Store version of euchre; the majority of in-game conversation is maintained through a couple of stock phrases and images. At Yahoo Games, players expressed themselves every few hands, but the Euchre 3D games I’ve played were mostly punctuated with curt and preprogrammed responses like “Good game” or “Ouch.” While you can type chat messages to your partner as you play, most players never even bother, and even regularly drop out in the middle of games. When they do, a euchre bot takes over. The problem is that it is tremendously difficult to design AI that can cooperate with the finesse of a great euchre partner. A few years ago, Benjamin Seelbinder, a software engineer at the University of Nevada, Reno, tackled the problem of cooperative AI by creating a series of euchre bots for his graduate school thesis. He loved playing euchre, and the game presented an intriguing set of problems for a computer scientist; a chess computer only needs to look out for itself, but a euchre bot needs to weigh its decisions against its partner’s strategy and the decisions of two opposing players. “You have to not only look at how your heuristics are determined, but you have to look at the heuristics of others. And that’s where cooperation is going to get hard,” Seelbinder told me in a telephone interview. Seelbinder tried to create an AI that could cooperate with its partner instead of dominating with the ruthless strategy of a chess computer. Unchecked aggression and selfish play will help a computer win every single chess game, but that same single-mindedness produces the “sheer stupidity” and one-sided play that drove digital euchre players crazy. Over a year and a half, he designed a set of seven euchre bots that could perform along the entire spectrum of euchre behavior, each embodying a different style of play, ranging from aggressive to cooperative behaviors. While he has continued to work on his bots, he has no plans to release them to the public because he doesn’t want to replace his human partners with robots. “Euchre brings people together in a way the Internet has kind of screwed up,” he said. How could the Internet save euchre, after all? When you strip away the conversation, all that remains is euchre’s uncanny ability to fritter away time. But the Internet and smartphones and social networks already offer a superabundance of lonesome distraction. No one needs another app to pass the time, no matter how eloquent its bots or canny their playing strategy. Euchre passes idle time with real people in real life, a kind of loafing that feels as endangered as any card game.